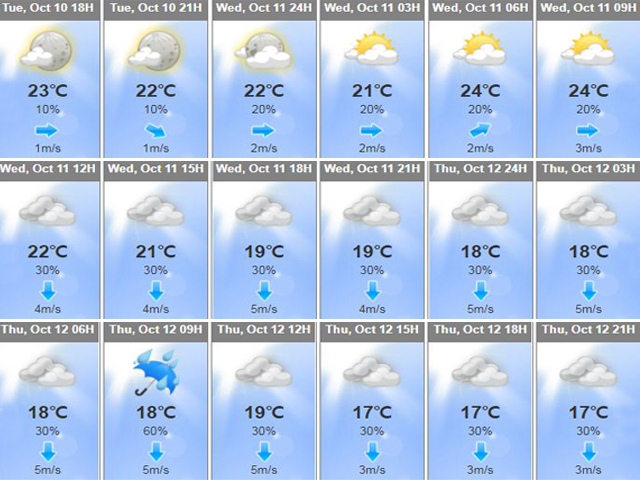 The temperature will drop in Jeju from the 12th of October and the cold weather will continue. Jeju Regional Office of Meteorology predicted on the 10th that Jeju will be mostly clear due to the effect of high pressure. Today, the lowest temperature in the morning is 20 degrees and the highest temperature in the day is expected to be 26 to 27 degrees. It will be cloudy on the 11th by the effects of low pressure passing through North Korea. Starting from the 12th, the temperature will drop in the morning and evening, and it will be similar to last year, which ranges from 17 degrees at the lowest and 19 degrees at the highest. Jeju Regional Office of Meteorology also said, "From the afternoon on the 11th, since cold air flows in from the northwest side, the wind will blow strongly and the temperature will be lower."